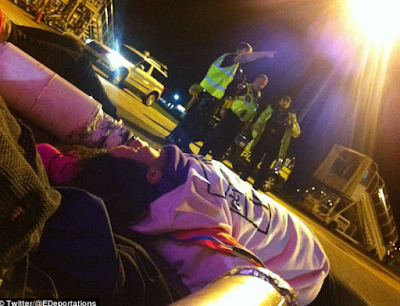 Up to 12 activists broke through security at Stansted Airport tonight and chained themselves together on the runway to stop failed asylum seekers being deported. They were heard chanting: 'No borders, no nations, stop deportations'. One of the activists blocking the runway, Emma Hughes, said she was trying to prevent families from being separated.